Kill Bill Vol. 1 & Vol. 2 on Blu-ray will simply be what is was when it was released on DVD, a two-pack of the individually discs, except this time in high-definition. The Blu-ray Disc set is priced at $69.98, and individual discs priced at $34.99. No discount on the 2-pack, but you would expect retailers to drop the price. Here are some extras that may entice you to pick these up. ‘Vol. 1’ will contain the “The Making of KILL BILL Volume 1” , an extra musical performance and trailers from Tarantino films. ‘Vol. 2’ will give you another documentary “The Making of KILL BILL Volume 2” along with a deleted scene and additional musical performance. The Blu-ray Disc formats are widescreen 2.40:1 1080p AVC with audio in 24-bit 5.1 PCM surround. 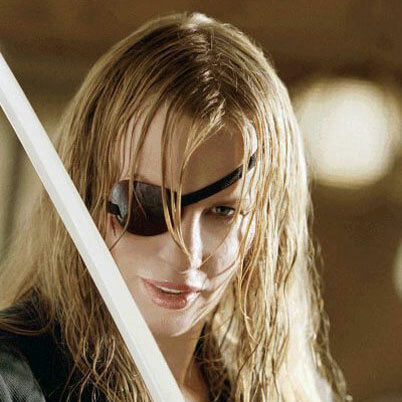 Still no news on any rumored Kill Bill – The Whole Bloody Affair release, as was previously written about. Not buying unless it’s the uncensored Japanese version of Vol 1.